Vitamin C is arguably the most vital nutrient in the human diet and grapefruit has plenty of it. With antioxidant, antiviral, antibacterial, and anti-inflammatory properties, this vitamin provides essential support to the immune system. 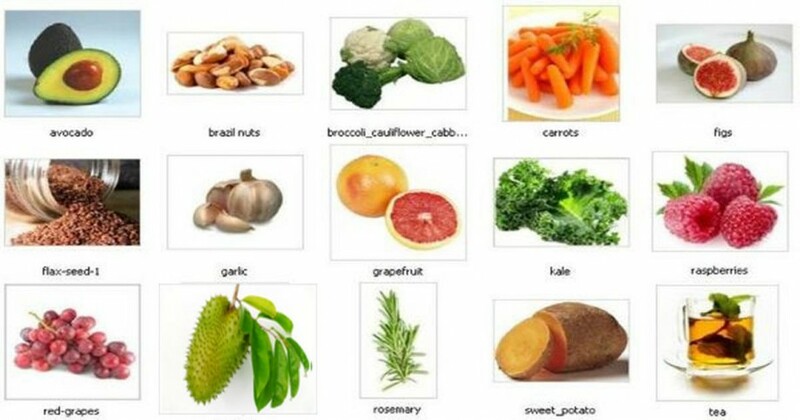 It also fights oxidative stress caused by free radicals (10). The catechins in green tea are strong antioxidants that promote the development of healthy cells and stop the spread of abnormal ones (11). Green tea is also a potent anti-inflammatory compound and can help regulate cholesterol (12). Spinach, lettuce, chard, mustard greens, and kale are a few examples of leaf vegetables rich in vitamins, minerals, and fiber. Phytonutrients in the carotenoid group such as lutein, zeaxanthin, saponins, and flavonoids are abundant in these types of vegetables and have been shown to prevent abnormal cells from occurring. “Researchers believe that carotenoids seem to prevent cancer by acting as antioxidants – that is, scouring potentially dangerous ‘free radicals’ from the body before they can do harm. Some laboratory research has found that the carotenoids in dark green leafy vegetables can inhibit the growth of certain types of breast, lung, stomach, and skin cancer cells.” (13). Lycopene is what makes tomatoes red. As a powerful antioxidant, “…lycopene has been proven the most potent of all the carotenoids in quenching singlet oxygen, a highly reactive and short-lived molecule capable of causing extensive cell damage.”(14). Similar in appearance to ginger in its raw form, turmeric has a mild metallic flavor adds body and depth. The spice has been shown to be a very powerful anti-inflammatory due to the phytonutrient curcumin. Effective in treating arthritis, fibromyalgia, and other inflammatory diseases, curcumin targets cancer stem cells, inhibiting their growth. It prevents cancer from ever starting and gets to the root cause of cancer where it exists. This is by no means a comprehensive list of all the gifts nature has to offer, but incorporating some of these foods into your daily diet can help to prevent cancer and stop its proliferation.